Located to the north of Fuerteventura, very close to the Dunas de Corralejo National Park, you will find the modern facilities of the Hotel Arena Beach Fuerteventura. 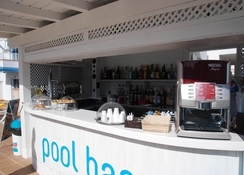 At the hotel guests can enjoy a large outdoor pool (there is also a separate pool for the little ones), surrounded by a large sunbathing area with sun loungers while having a drink on the terrace of the bar. Guests can also enjoy a wide range of relaxation treatments including a spa, massage, sauna and Jacuzzi. Among the facilities you can find a modern and bright restaurant, which offers gourmet and buffet style dishes, as well as access to an outside terrace and another bar located in the lobby. A children's playground, a recreational games room, a TV room, a mini-children's club, a complete gym where you can exercise while enjoying the panoramic views and a theater tent where entertainment is offered, complete the wide range of facilities that are available at the Hotel Arena Beach Fuerteventura. 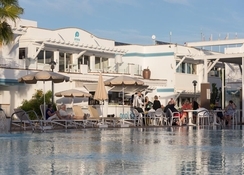 Hotel Arena Beach Fuerteventura is located in the town of Corralejo, north of Fuerteventura, within walking distance of beautiful beaches and the Dunes of the Natural Park of Corralejo. The urban center is a few minutes’ walk away and there you can find shops, supermarkets, restaurants and bars. It is an ideal option to enjoy the beaches and to practice water sports such as snorkeling or surfing, and the airport is 40 minutes away by car. Hotel Arena Beach Fuerteventura offers a total of 136 apartments for guests. They can choose between two types of apartments, double with balcony or double / triple with terrace, they offer views of the swimming pool area and are characterized by their luminosity and modern decoration dominated by shades and white colors, with touches of blue. The accommodation has a bedroom, a full bathroom with bathtub and hairdryer, a living room with sofa bed, dining table and chairs and a kitchenette, fully equipped with appliances and kitchenware. They also have a flat screen TV, a Wi-Fi connection and an in-room safe. In the premises there is a modern and bright restaurant, which offers gourmet cuisine in a buffet and with access to an outside terrace. There is a bar located in the lobby and another in the outdoor pool area. You will only be a few minutes’ walk away from a host of local bars and restaurants when staying at the Hotel Arena Beach. The outdoor pool area has a large solarium area with sun loungers. The hotel offers a spa with sauna, Jacuzzi and a relaxation area where massages are offered in addition to a children's playground, a recreational games room, a TV room, a mini-club for children, a complete gym where you can exercise while enjoying fantastic panoramic views. There is also a golf course located 11.8km from the property. We stayed at the Arena beach from 17th till 24th of May and found the hotel first class, the food was great and the staff were friendly, the rooms were also well equipped and they even had a washing machine. All in all we had a great time and would recommend this hotel to anyone who wants to have a nice relaxing break, we will certainly return. Lovely complex, friendly staff, accommodation not bad have stayed at better but adequate. Arena Beach is fabulous place. We would live to come again. Amazing hotel, very clean, staff were excellent. Food choice was 10 out of 10. Evening entertainment was very good and bar always staffed. We had a great holiday. Great selection of food offered. All inclusive needs are catered to. Wish we could have stayed longer. Great place to stay.pools great food nothing special but could eat so will not starve. Lounge could do with some up grading and soft furniture and no entertainment as such.but great place to stay would recommend.